I intended for this site to be a place to promote my books and to share fun stuff I do from time to time, as well as what little writing wisdom I have. But I need to talk about my experience with having solar panels installed on my home and how that’s turned into a nightmare. I have two “patches” of panels installed on the southern side of my house so they can get as much sunlight as possible. 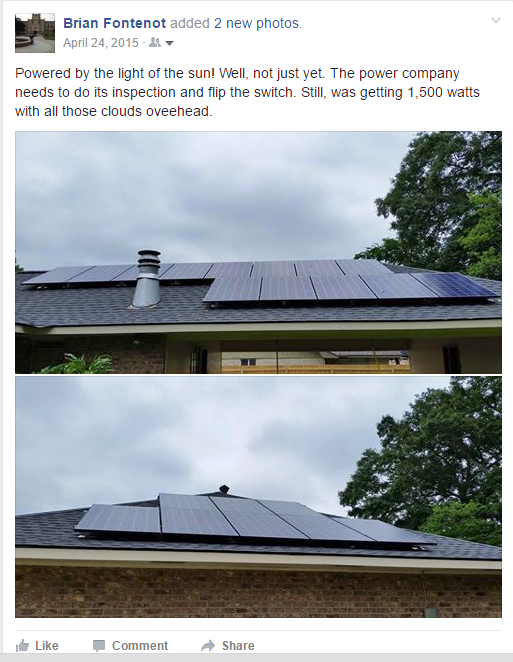 Below is a capture of the Facebook post I made back in April of 2015 after having the panels installed. If you’re able to read the quote, the local power company came out to inspect the system and to officially turn it on before mid-May. The system costs $21,000.00, plus another $100 or so for the net meter. Before we go further, there are some things you need to understand about solar panels. They in no way actually help the environment. Their efficiency is at best %20. They’re production and disposal creates toxic waste. Each year they generate power, they lose efficiency. Over 20 years, my system is expected to have its electricity production halved. When power goes out, which it often does, the solar system disconnects from the electrical grid as a safety measure for any of the power company workers trying to repair the system. So, when the power goes out, even if it’s bright and sunny outside (which happens), I still lose power. The only way to get around this is to purchase and install an expensive battery system that wears out and dies usually in about 4 years. Solar panels are also far too expensive to be practical. So much so, without substantial tax credits you’re basically wasting thousands of dollars. Even if my system were to stay at its brand new electricity generation level indefinitely, it would take about 30 years for the system to pay for itself at current energy prices. More than likely though, the panels would never be able to pay for themselves as their generation continues to degrade to nothing. So, you may be wondering why, if I knew all of this, did I got a solar system installed on my home. First, Louisiana, where I live, has had a very generous tax credit (%50 of the cost up to $25,000) to help homeowners purchase solar systems. Coupled with the still ongoing %30 Federal tax credit for said systems, you could get a $25,000 system installed at %20 of the total cost (or basically for free with financing). And if you look at my generation numbers and consider %20 of 21,000 is $4,200, it would only take 6-8 years for my system to pay for itself. Not only that, but the solar installer I used made a contractual guarantee to make up the difference of expected versus actual power generation in the first year, which ended up netting me another $200. Second, I had been interested in taking advantage of the solar credits for a while, because they were supposed to go away in 2017 if not earlier. What kept me from pulling the trigger was I needed a new roof first. And I got one installed in late February of 2015. So, the timing seemed great. Third, I naively considered that having a $21,000 system installed on my house for power generation would increase my home’s value by some percentage of the cost of the system. At the time, I was very close to escaping having to waste money every month on mortgage insurance or PMI. I figured I could get the system basically for free, have it installed, get my home reappraised, and then save on the additional cost of PMI every month. With all of these things in mind, I signed the contract and was thrilled to have my system installed. It was so neat to keep peaking at the website that reports the power generation or to go look at the actual meter. And I paid for it through an 18 month, no interest, no payments plan for the %80 of the cost (17% deferred interest) I was going to get back in tax credits when I filed in January 2016. And it turns out I was wrong. Critically wrong. The appraiser couldn’t determine what, if any, value the system added to my home because no homes with systems had been sold in the area to make a comparison. It was still too new. So, any hope I had of escaping PMI early died. And as some many have heard, the State of Louisiana fell on some hard fiscal times. Our state has never been good about managing money and spends it all when it has it. So July of 2015 comes and the legislature is having its come-to-Jesus moment about the budget. They start cutting tax credits and raising taxes. Which is fine, you have to do what you have to do. But they decided to change the solar tax credit law. They decided to cap it. They had already spent close to $150 million on the credits and now they needed that money. Again, this is fine. Times are tough, so turn off the spicket. But they went and did something horrible and potentially unconstitutionally. They made the cap to the tax credit RETROACTIVE. To be as clear as possible: In April of 2015, I financed $16,800 for 18 months because I was going to get a Federal tax credit and a State tax credit to pay for this amount in early 2016. In July of 2015, the legislature added a $10 million cap for 2015 for the credit. The credit, if you read the law linked above, is paid out on a first-come, first-served basis. So, in July of 2015 I found myself placed in a race to file my taxes. I filed my income taxes on the first day of filing in 2016 with Turbo Tax (lots of problems, tech support). January 19, I believe. And this was in spite of trying to amend my return after my house being robbed three days later on the 21st or so. Still, I got it done. I ended up having to fax my solar credit form in on the 22nd. See, the State was criminally late in setting up its electronic system for receiving the packet of paperwork required to claim the tax credit. 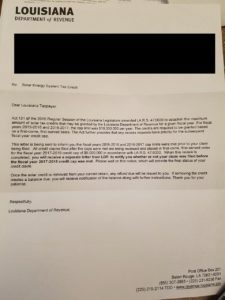 It still accepted my income tax filing on the 19, but I had to fax the paperwork into the Louisiana Department of Revenue a few days later (no email? seriously?) and got confirmation of receipt of the materials in mid-February of 2016. Sometime in late March or early April, I got a letter from LDR requesting that I send in an invoice for the system, so I did. Note, this request for additional paperwork, even paperwork that had already been included in the initial packet was not an uncommon occurrence. I know of two other people who had the same experience. It’s not July 22, 2016 and I haven’t gotten my state income tax back. And this is what the credit situation looks like. While I received my Federal tax credit of $6,300, it’s increasingly looking like I’m going to get left holding the bag for $10,500. And this is money that needs to be paid off in some form before the 18 months runs out or I could also find myself responsible for thousands of dollars more in deferred interest. A friend of a friend got this letter in the mail from LDR today. I added the black bar to protect personal information. I haven’t gotten my letter, yet. I still may not. But I know I’m not alone. There are a lot of people like me that took advantage of what the State had been encouraging us to do for years and then left us holding the check. We agreed to play the game and the State changed the rules on us after we made our move. Had there been a cap in place in April of 2015, I’d never have taken the risk, because I’m not a moron. I’ve tried contacting my local representatives and senators about my plight. I’ve emailed the local media, but they’re just starting to wake up to the issue and are still missing the point. They’re falling back on the same lazy angle of the strident solar energy industry bracing for the loss of business instead of speaking up for the people being hurt by incompetent governance. This could lead to a pretty embarrassing and expensive class action suit against the state. But in the near term, all I can do is wait to see what happens with my credit, spread the news about the people that have been burned (because the media isn’t), and plan for what to do if I suddenly need to come up with the equivalent of a new down payment on a house. Yes it happend to me. There was no talk of the cap when they installed the system. Now got the letter saying I didn’t make the cutoff before the cap. This is BS. How could anyone pay on a 30k loan with 18% interest rate. We all need to step in and try to get our credits. What can we do? I’m not sure what your financing plan is, but I’m looking at either doing a balance transfer to a new credit card at an X months no interest plan or considering getting a standard loan from the local credit union. Even with the interest from the latter or the transfer fee, it’ll still be a far better thing to do than to eat that credit card rate, deferred interest. Another alternative that the solar installers that so care about our well-being can do is to “refund” or purchases and then let us purchase the systems again with a fresh no interest, no payments plan. Past that, all we can do is keep talking about the issue and get the topic going on social media. And we can get in touch with our local reps and senators. I don’t believe they did this on purpose. They made a miscalculation and they can come up with some kind of fix. I could have written this article almost verbatim. Thank you for speaking out. I reached out to my representative and he assured me last week that my return was verified and confirmed and that rebates were being sent out the week of July 18. I have not received the rebate, nor have I revived a letter. My plan was to do a rollover to my credit card and pay the 3% fee to pay the bill over another 12-18 months. If I don’t get my rebate, you can count me in the class action suit. I’m furious over this mess! There are questions that need to be answered, I think. First, how many of the tax credit apps are for systems before the law change versus after? And did the Legislature have these numbers in July? Second, what does first come, first served really mean? Are they actually following the law as written? They must have multiple people reviewing the applications at the same time. Why is so much paperwork being lost? The media hasn’t asked these questions, yet. I am livid over this whole thing. I am in the exact same boat. We got our panels way before any talk of running out of funds. We were just told that as long as they were installed before July 2015, we were going to be eligible for the credit. We paid extra money to get our taxes prepared this year (I always do them on turbo tax otherwise) just to make sure that everything went smoothly. When I got this letter last week it was like a punch to the gut. I am a mother of three children and I am always careful about how I spend my money. I am in my second year of school (as well as working full time) to be a teacher. I have to quit my job in fall of 2018 to student teach so I have been spending the last two years paying down car notes in order to be able to make this transition. If this credit falls through, I will not be able to afford to student teach because I will have to bust my tail to pay off something that I would have never agreed to pay $20,000 for (the amount of my loan, not to mention the back interest that gets added). It’s not like you can say never mind either, there is no return policy. They sold you a product at one cost, changed the amount you owe by thousands, and then leave you to figure it out. How is this legal? Not getting this credit is going to cripple my family when we have already been living penny to penny over the years trying to make a way for a better life later. We are going to suffer for years due to this situation. I am so disappointed in my government. I am in the exact same boat. Count me in if a class action suit is started. I’ve contacted every legislator for my area and have spoken to the LA dept. of Revenue several times. All they say is that they have to follow the law the way it is written. Great, but the law was different from Jan 1 to July 1 compares to July 1, 2015 forwards. Subsequently, we should be held against the law at the time of system installation!! How can you change a law and make it retroactive? What a disaster by Louisiana…unimpressed!! I too am stuck holding the trick bag (of bills). I had my $30k system installed June 2015 (purchased April 2015), with full expectation of receiving the $12,500 La Rebate that was in place at that time for those who purchased, prior to the July 2015 legislation. This rebate, along with the federal tax credit was sufficient to cover my 17.99%, 18 month, no payment, no interest loan. I also received the “so sorry Charlie” letter stating that ” … 2015-2016, 2016-2017 caps were met …..” I am praying, waiting, with great hope that I am fortunate enough to be included in the 2017-2018 count. Having business ventures, and the scruples to file a completed tax form, left me unable to file my taxes as early as I’d like to have, not that it would have been fruitful, If anyone knows of any actions being taken, or any pertinent information regarding this matter, I would be most abliged to hear about it and I will post the same, if I hear of any such news. Good luck to all of us! 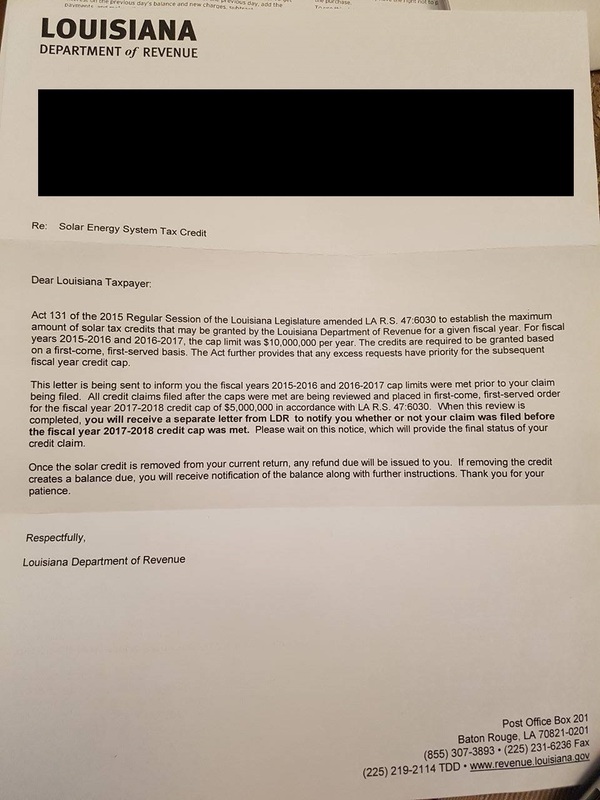 Today i received a certified letter from the Louisiana Dept of Revenue informing me that I am now officially denied any solar credit, due to the depletion of funds prior to my tax return being received. I am to file an appeal, if I wish my case to be heard. I sincerely feel terrible for you all. To start getting these bills/decisions during everything else that’s happening is just an extra kick in the teeth. All you can do is keep fighting however you can. I believe, though, that this was not done maliciously by the legislature and if you can keep on them about it they will amend the law. They know it’s wrong and wouldn’t want to be in your shoes.